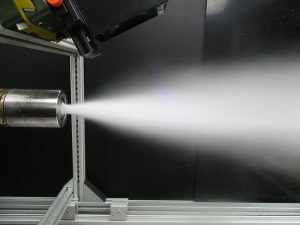 Spray lances are used in many industries like the chemical or pharmaceutical indutry. However, due to the very dense spray it is hard or even impossible for other measurement technologies to measure those sprays. 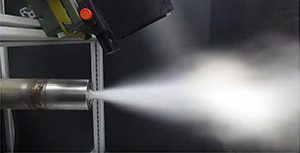 Due to the backscattering organisation SpraySpy can measure even sprays with a high volume flow rate like those from spray lances. The picture below shows the measurement of a spray lance at the BASF SE. Measurement of a spray lance.